“Belladonna of Sadness” offers a great tale told in a very unique animation style, and is going to stay with me for a while. My only complaint were the more surreal scenes that seem to invite substance abuse, and which started to get on my nerves a little bit the more and more the film progresses, due to their increasing rate and length. Otherwise, it’s equally beautiful, fascinating and disturbing. The animation was absolutely beautiful. Yes, it’s noticeable – especially in the beginning – that they ran out of money, and thus couldn’t finish some sequences, instead just showing still drawings that are panned over, but they really made a virtue out of necessity. Said style, together with the great story that takes a tragic turn right at the beginning, drew me in right away. The rest of the movie is absolutely beautiful to look at, often times giving preference to rather surreal, suggestive and/or symbolic images and animations that really brought this sad tale to life. As mentioned before, I could have done without the more psychedelic scenes, which also occasionally went on for too long, but otherwise, the visuals of “Belladonna of Sadness” were absolutely stunning and unique. Same can be said about the songs and the music, which accompanied this movie really well. I especially loved the gloomy, melancholic main theme, but the rest was also beautiful to listen to. And the story was great too. 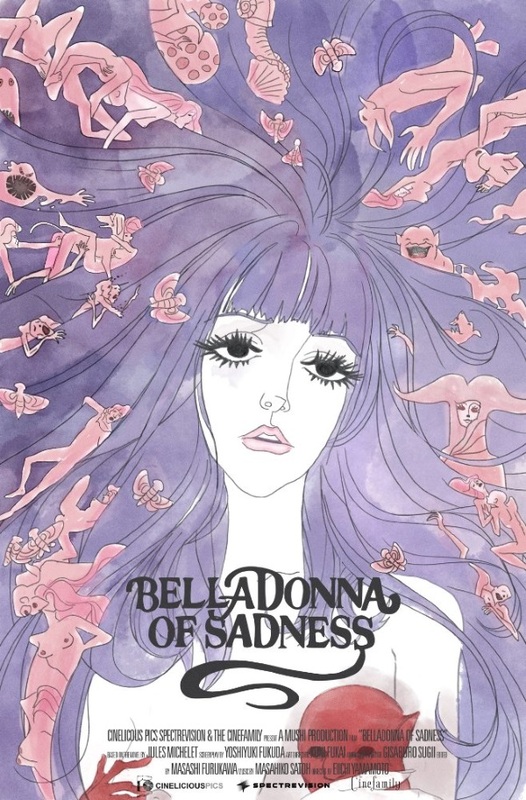 “Belladonna of Sadness” tells such a sad and tragic tale, which also entails a nice, feministic message. I also loved how freely interpretable it is. Is the devil something that is brought upon us by other men? Is it something that we invite into our lives? Or is there no devil, and it’s just symbolic of Jeanna losing herself more and more? The only thing that I didn’t quite get was her ultimate decision when talking to the baron. The movie could have made it a little clearer why she (re)acts the way she does. Nevertheless, it ultimately lead to a sorrowful ending that I very much enjoyed. All in all, I’m very glad that I finally had the opportunity to watch it. Its shortcomings may prevent this from being an outright masterpiece, but the greatest tragedy of “Belladonna of Sadness” is how forgotten and overlooked it became in the intervening years – something that it definitely doesn’t deserve. This entry was posted in /slash, cinema 2016, movie reviews and tagged /slash, /slash 2016, animation, Belladonna of Sadness, cinema 2016, Eiichi Yamamoto, japan, Kanashimi no Beradonna. Bookmark the permalink.